Even with tropical breezes and turquoise waters calling seductively from the South, Bay sailors this October can find their own patch of paradise among the Chesapeake’s bevy of beautiful islands that lure with natural beauty, distinct charm, and storied pasts. Whether celebration or solitude calls, a Chesapeake island answers. Hart-Miller Island often draws hundreds of boaters—power and sail alike—on weekends. Located off of Back and Middle Rivers on the Upper Bay, the island is a state park with moorings and a large anchorage off the western side of the island and with shore access on the south cell of the island, at Hawk Cove, and at Pleasure Island. Frequenters of the anchorage praise its fresh swimming, fun-filled atmosphere, and long beaches perfect for families. The anchorage, however, offers little protection from any unsettled weather or from wakes. 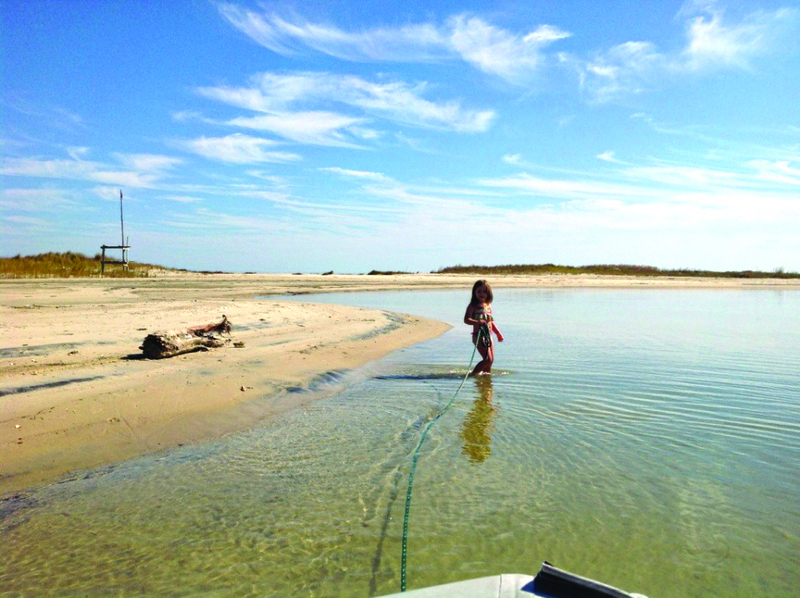 Further south on the Magothy River, privately-owned Dobbins Island offers its own festive atmosphere. The lovely scenery of the anchorage on the north side of the island regularly attracts hundreds of daytrippers on the weekend. Popularity goes hand-in-hand with wake, yet the anchorage usually calms down in time for a beautiful sunset. Coincidentally, both Miller Island and Dobbins Island enjoyed popularity as duck hunting destinations a century ago. They remain great spots for bird and people watching today. Bald eagles challenge osprey for their catch while blue herons glide gracefully, hunt stealthily, and squawk loudly, shattering the silence near Wye Island. Snakes, turtles, white perch, and blue crabs share the water with boaters, fishermen, and the overnight cruisers. Before becoming a Natural Resources Management Area in Maryland, Wye Island was privately owned and farmed for three centuries. Its former owners include Declaration of Independence signer William Paca and Charles Beale Bordley, who in the 1770s strove to make Wye Island self-sufficient. Under Mr. Bordley’s stewardship, Wye Island had vineyards, orchards, a brick yard, and a brewery. Surrounded by both the Wye and Wye East Rivers, Wye Island offers many sheltered anchorages from the popular Dividing Creek to the less frequented Big Wood Cove. 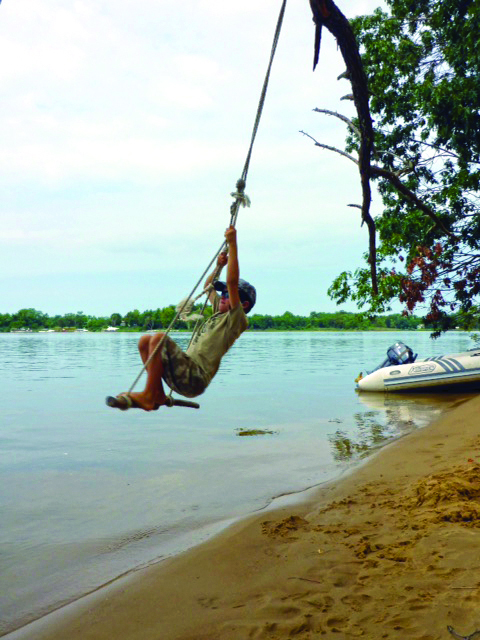 Easy shore access can be found at Drum Point and Dividing Creek. 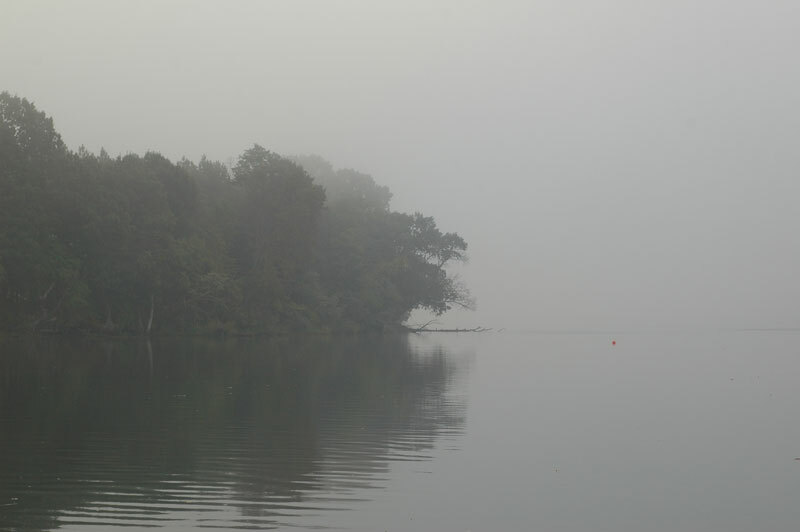 Moving further south and further into the past, St. Clement’s Island on the Potomac River marks where the first Marylanders led by Leonard Calvert dropped anchor in 1634. Later, the Blackistone family owned the island and farmed the land, and for 100 years, the Blackistone Lighthouse illuminated maritime dangers from the southern tip of the island. St. Clement’s Island is now a state park and features the St. Clement’s Island Museum at Colton Point, a reconstruction of the historic Blackistone Island Light, and a large stone cross memorializing Maryland’s first settlers. Docks on the north and south sides of the island are a water taxi landing that is sometimes used by transients. Thirteen miles east of the Potomac River, dissenters from St. Clement’s Island first settled Smith Island in 1657. Settlement spread to Tangier Island within a few decades. Still isolated today, for centuries these islands have been home to people with a distinct way of life and little connection to mainland Maryland and Virginia. During the 1700s and 1800s, the marshes and creeks that cut through these islands made them infamous as shelters and hide-outs for Chesapeake picaroons who raided shipping on the Bay. Today visitors come to experience the vibrant watermen’s communities that distinguish these islands. The water surrounding the islands is shallow with reported (and repeated) shoaling, so consulting up-to-date charts will help sailors navigate the channels near and through the islands. Two anchorages in Tangier Sound on the east side of Tangier Island offer beautiful sunsets over long stretches of sandy beach in settled weather. Gwynn’s Island, on the southern side of the mouth of the Piankatank River, is separated from “mainland” Virginia by a swing bridge, and that bridge seems to open up to a world with strong connections to the past. Remains of some earthworks from the Revolutionary War Battle of Cricket Hill garnish the channel on the way to the anchorage. The 1776 battle resulted in the ousting of the royal governor of Virginia and a group of 500 Tories, who had holed up on Gwynn’s Island prior to their defeat at the hands of patriot militia. Even neater and reaching farther back in time is the long, sandy beach with a vista straight down the Bay. Enormous oyster shells and occasional arrowheads wash up on the beach, testament to those who wandered this island perhaps thousands of years ago. 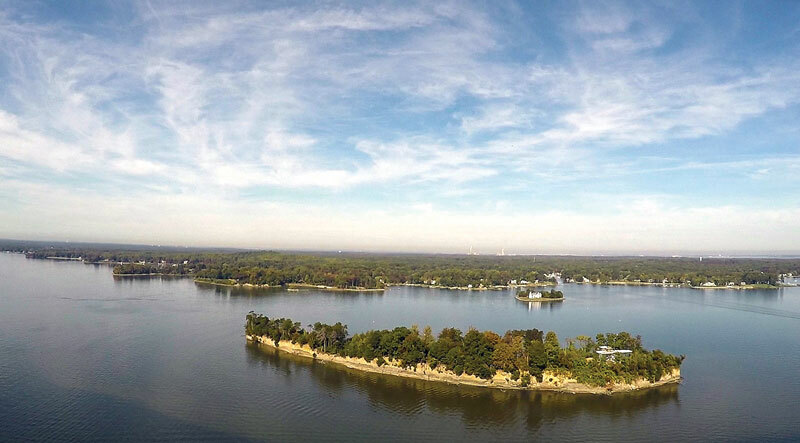 Of course, these aren’t the only islands in the Chesapeake inviting exploration. The scoop on Solomons, Tilghman, Cobb, Hooper, and many, many more can be found in local cruising guides, charts, and reviews on Active Captain. Isn’t it neat to think of setting the hook off the shore of one of these island gems as its 21st century history unfolds?